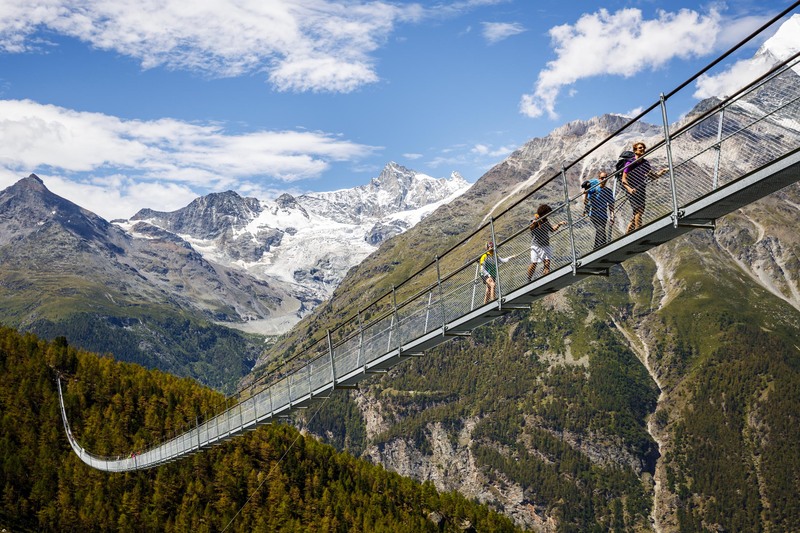 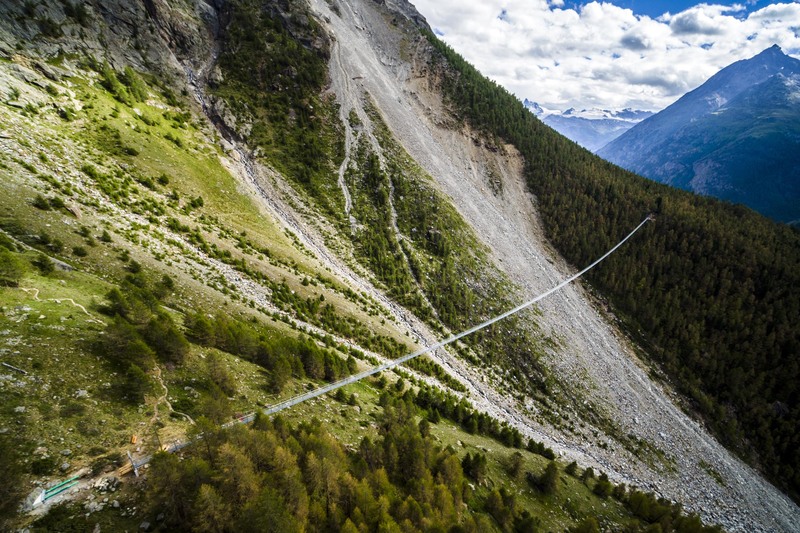 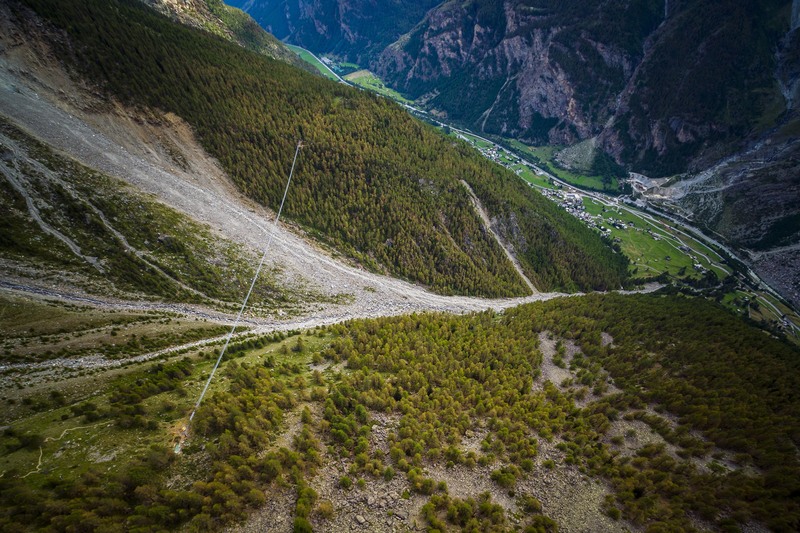 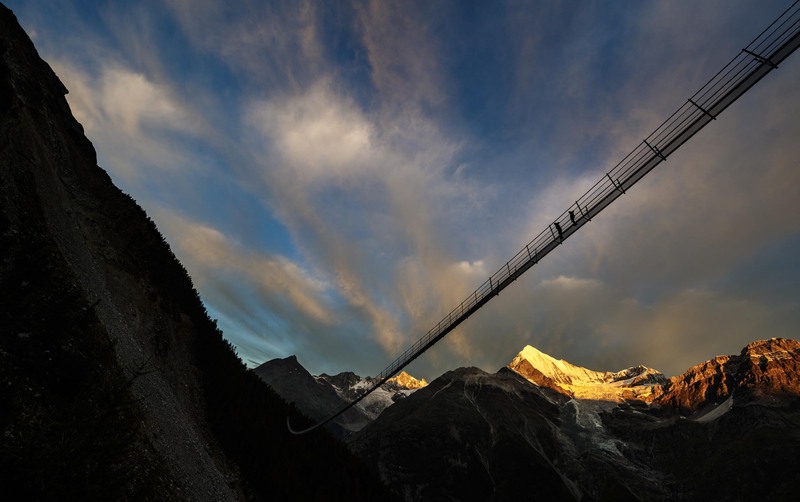 The pedestrian suspension bridge, named after main sponsor Charles Kuonen, measures a proud 494 meters in length and stretches up to a height of 85 meters above the Grabengufer ravine in Mattertal valley. 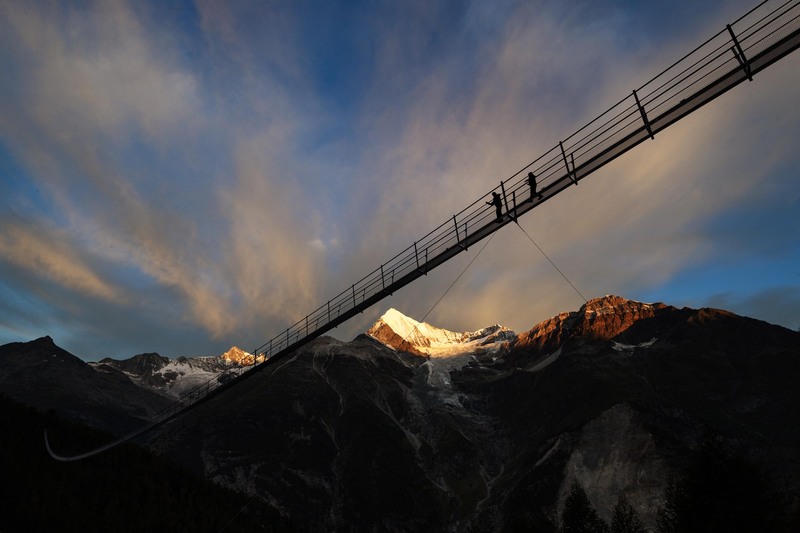 The bridge is intended to be a “monument for the mountain panorama”, whereby utmost emphasis was placed on interfering as little as possible with nature – a design that worked. 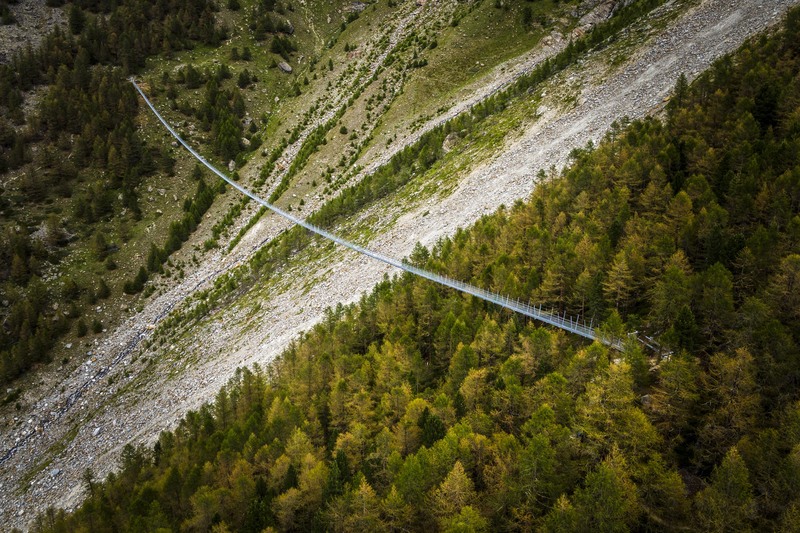 The transparent construction of steel cable and wire mesh integrates perfectly into the environment. 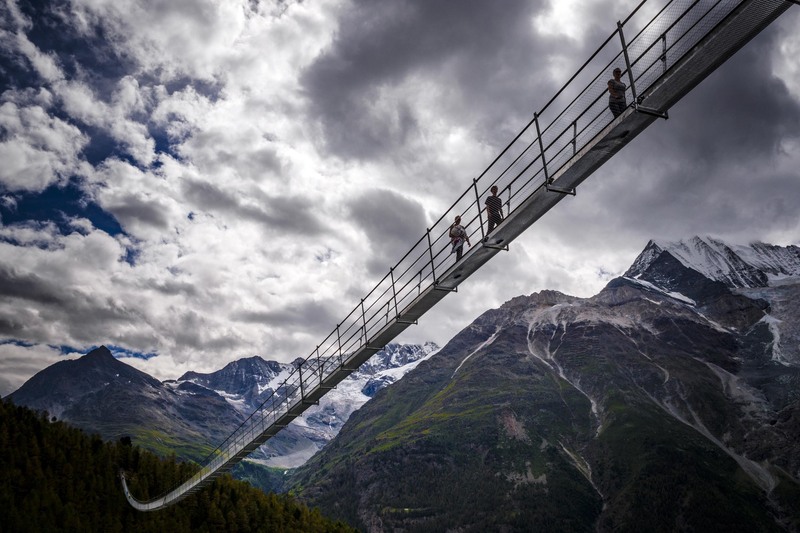 Working at a dizzying height, Swiss company swissrope finished construction of the bridge in only two and a half months by using special “assembly sleds”. 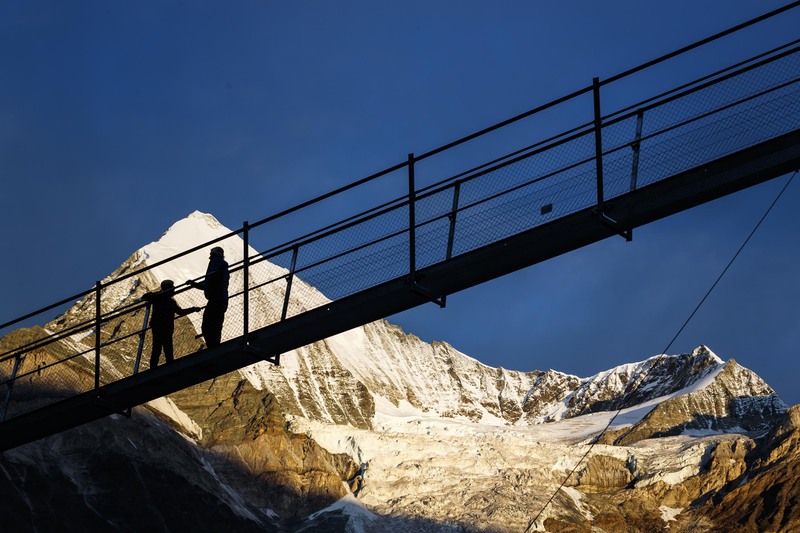 The anticipation for the world’s longest hanging bridge begins with the hikers who have already gathered in the Europa hut, which is located above Randa halfway between the 2-day hike between Grächen and Zermatt. 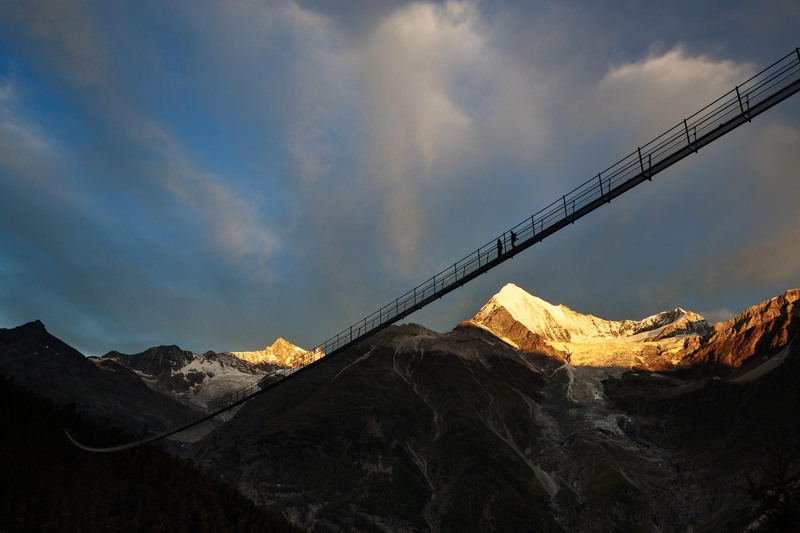 Once the first rays of morning sunshine pierce the tops of the majestic mountain peaks, the hikers are off, no longer held back by anything. 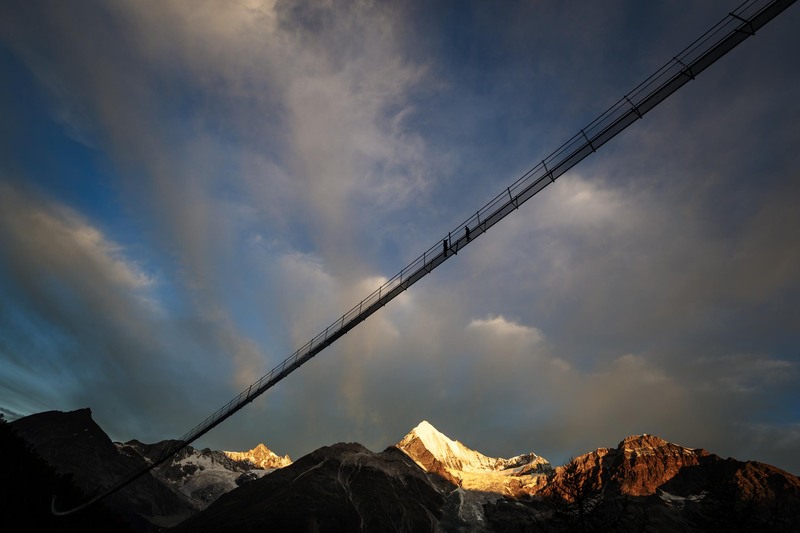 The hanging pedestrian bridge is reached a short time later. 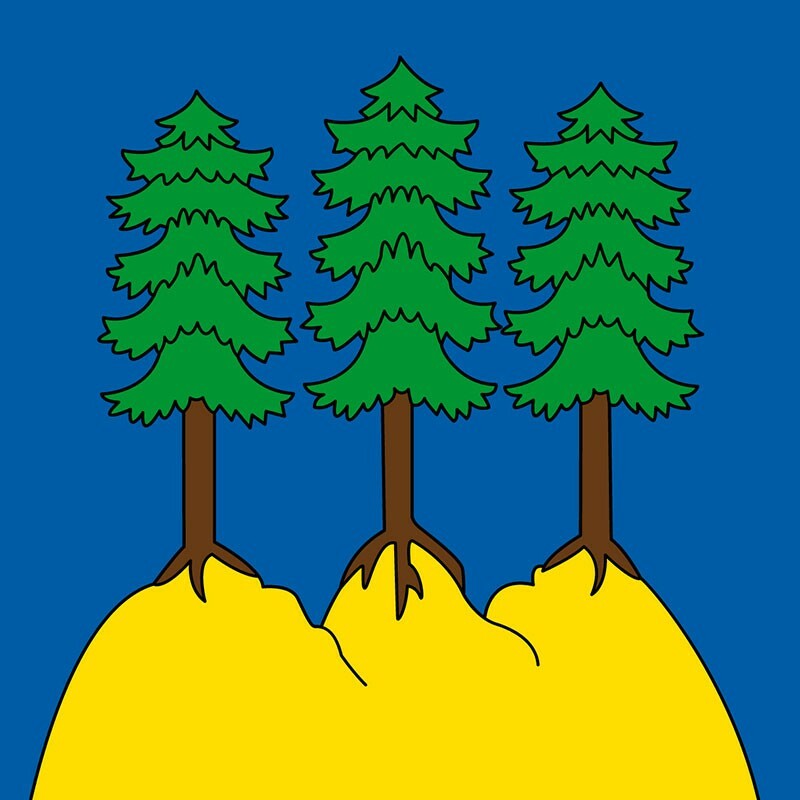 Nature lovers are accompanied by giant trees the first few meters. 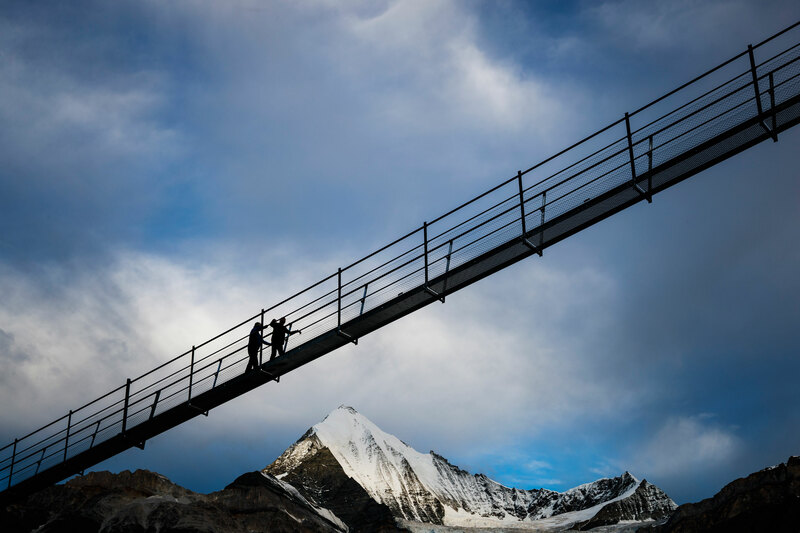 Just a few moments later, they are surrounded by the beauty of the mountains at the lofty height. 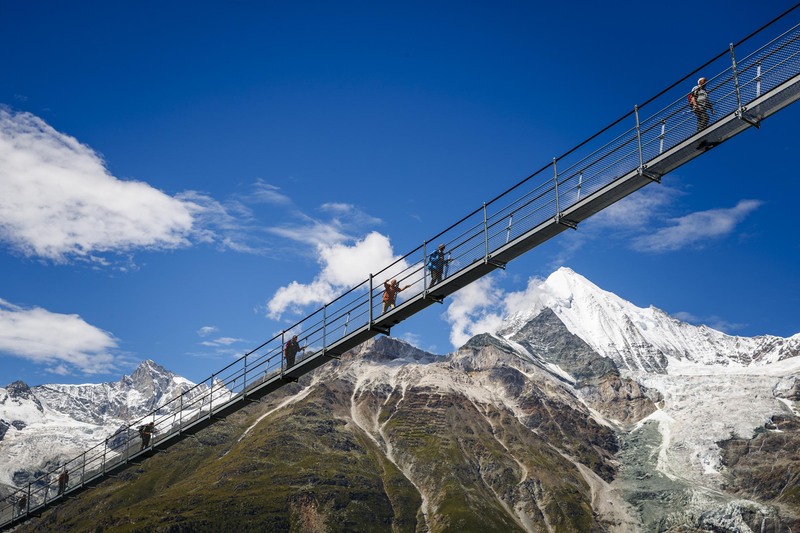 Switzerland’s highest mountains greet one on the Europaweg high trail. 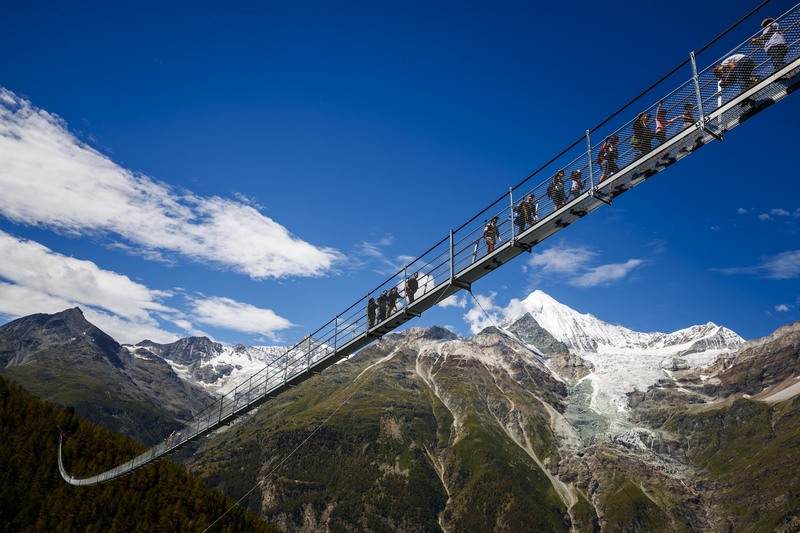 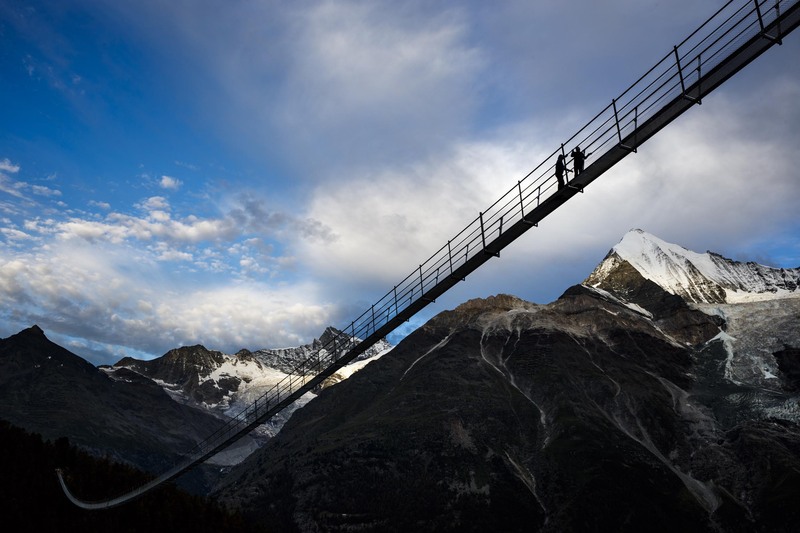 In the midst of the “Charles Kuonen Pedestrian Hanging Bridge”, time seems to stand still for a moment while one gazes at the Weisshorn and the wonderful mountain world of Mattertal valley – amazing. 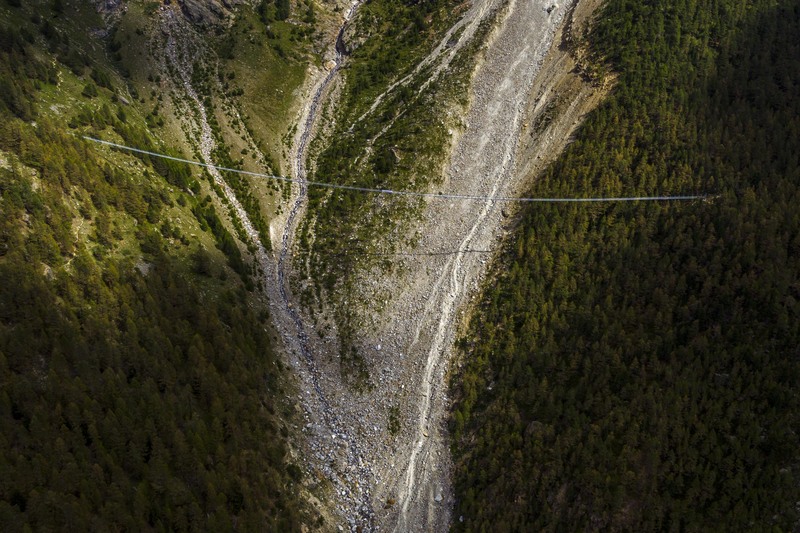 The slight thrill provides additional adrenaline. 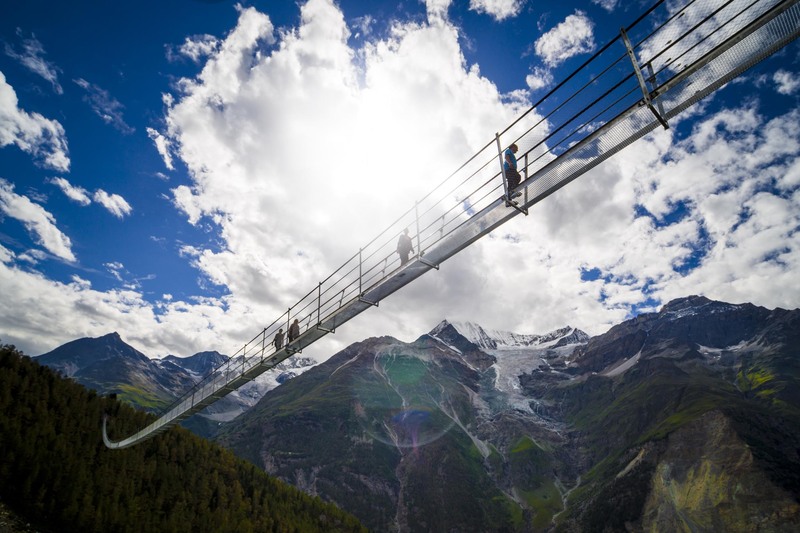 Thanks to the bridge’s transparent construction, the “glimpse into the depths” is always there. 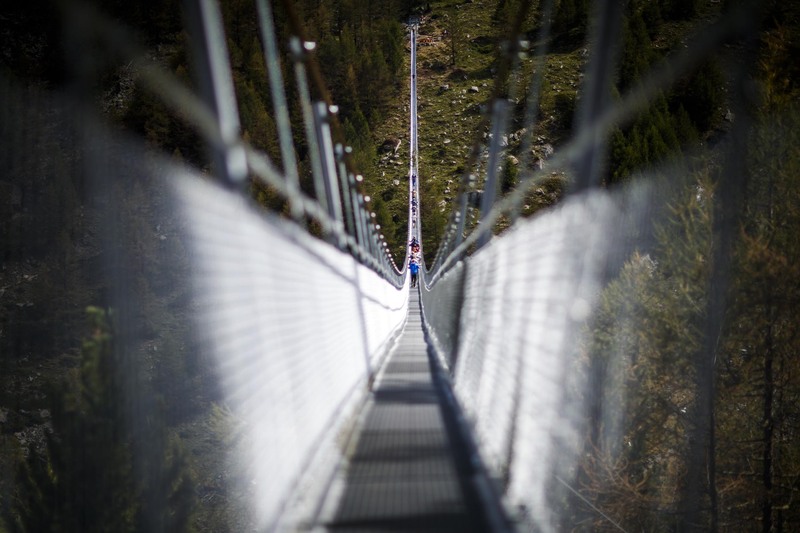 But not fear. 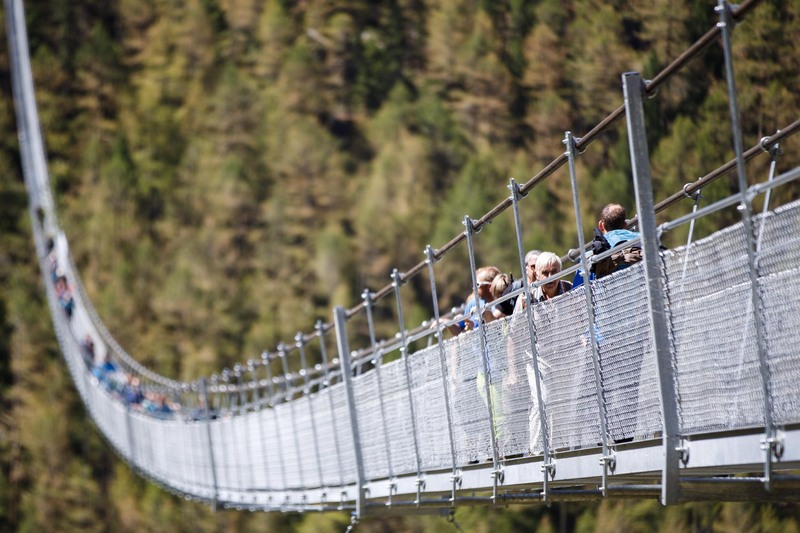 Among others, this is due to the fact that, despite its delicate appearance, the 65cm-wide suspension bridge is extremely stable. 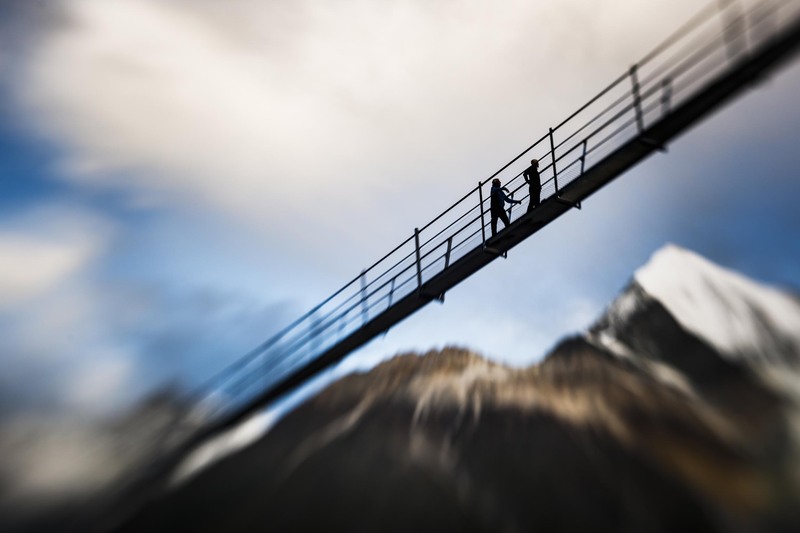 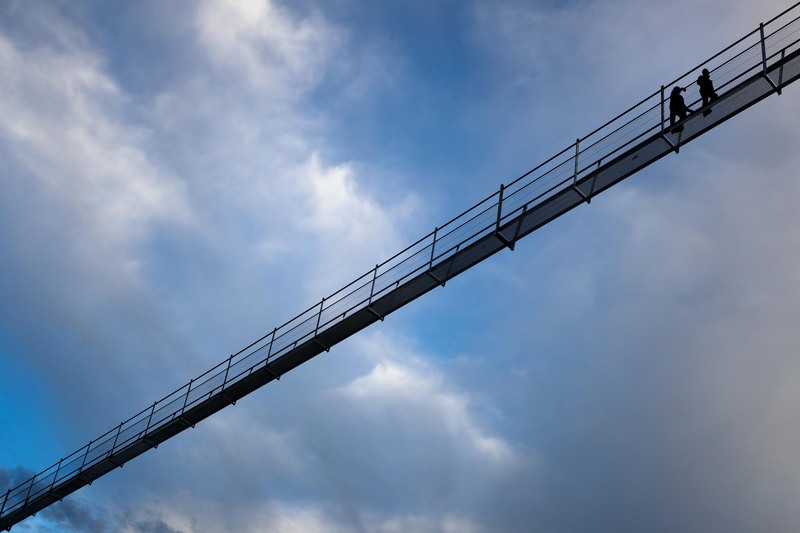 Although it seems practically impossible to depict the grandiose experience in two dimensions, the passionate photographer Valentin Flauraud has succeeded in producing a first impression of the bridge and landscape in his photos. 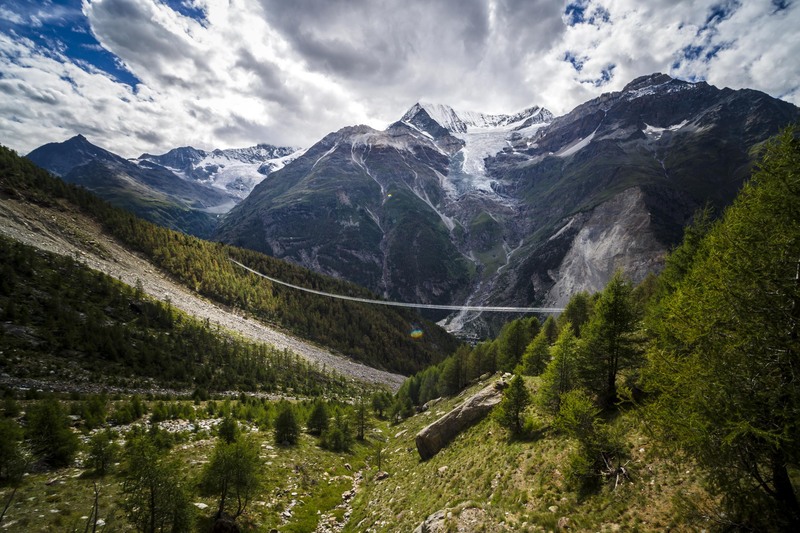 Nature lovers from the world over will no doubt feel inspired by them, and marvel in person at the longest pedestrian suspension bridge in the world near Randa. 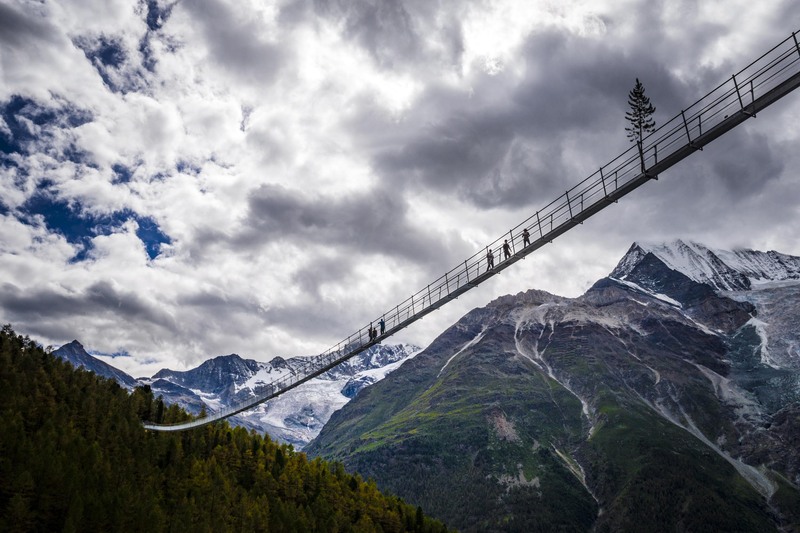 There’s nothing like experiencing bridge and landscape “live”.